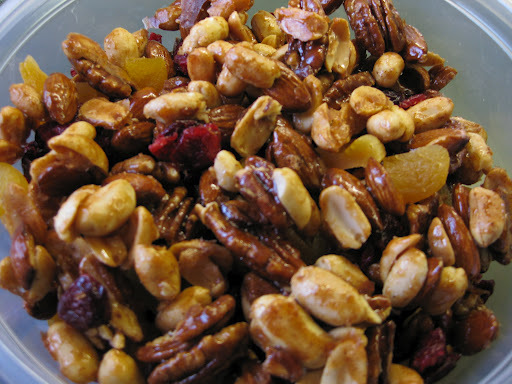 Another great nut recipe! I used a mixture of almonds, pecans, and peanuts. I used cranberries and apricots as the fruit. This recipe is taken from Canadian Living magazine December 2011. It makes about 6 1/4 cups. 1. In a saucepan, bring sugar, corn syrup, water, cinnamon, ginger, salt and chili powder to boil; boil for 1 minute. Stir in nuts to coat. 2. Spread on greased or parchment paper-lined baking sheets, separating with fork. Bake in 350F oven, stirring once, until golden and bubbly, 12 to 15 minutes. Separate with fork and let cool completely. Transfer to large bowl; stir in fruit. Amazing! I love the fresh basil in here. This recipe is taken from Guy Fieri’s cookbook “Food”. 1. In a medium saucepan, heat the olive oil over medium-low heat. Add the onion and cook until translucent, about 4 minutes. Add the garlic and cook until the garlic is almost brown, another 2 minutes. Add the tomatoes. Simmer for 30 minutes. 2. Add the basil and oregano, and simmer for 30 minutes more to thoroughly marry the flavours. 3. Purée the mixture with a stick blender, food mill, or food processor. Add salt and pepper to taste. Freeze the extra sauce for the future. My husband said that these are the best meatballs he’s had. This recipe is taken from Guy Fieri’s cookbook “Food”. It makes 24 meatballs, to serve 8. I used ground pork instead of the sausage. I also used 1 tablespoon each of dried basil and dried oregano. 1. In a large skillet over medium heat, heat the extra virgin oil. Cook the onion, bell pepper, and chili flakes for 2 minutes. Add the garlic and salt and cook until tender, about 4 minutes. Transfer the vegetables to a large bowl and let cool. (Keep the pan handy). 2. Meanwhile, pour the milk over the bread and let soak for 5 minutes. Drain off the milk and lightly squeeze the bread, so that it is moist but not wet. 3. To the bowl with the cooled vegetables, add the beef and sausage, soaked bread, basil, oregano, pepper, parsley, grated Parmesan, and eggs. Mix thoroughly but gently and shape into 2-inch balls, the more gentle you are, the more tender the meatballs will be. 4. In the same pan used for the vegetables, heat the oil over medium heat. Cook the meatballs in batches, browning each completely. Continue to cook until the internal temperature reaches 165F on an instant-read thermometer. 5. Bring a large pot of salted water to a boil. Bring the marinara sauce to a simmer over low heat. 6. Cook the spaghetti al dente, according to the package directions. Drain and toss with about 2 cups of the marinara sauce. 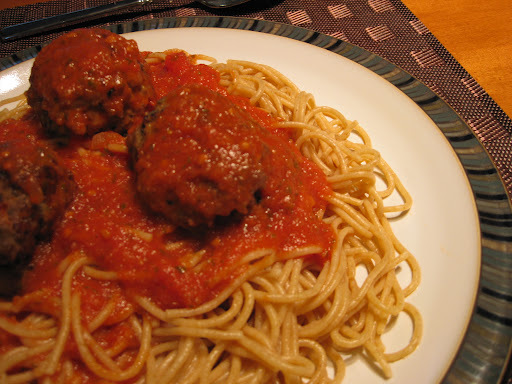 You can either portion to individual plates or pasta bowls, add more sauce and 3 meatballs per person, and garnish with shredded Parmesan, or place the pasta in a large serving dish and top with sauce, meatballs and Parmesan.